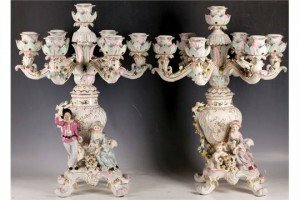 A pair of Thuringian style six branch, seven pot candelabra, applied floral and leaf decoration, one with 17th Century couple to base, the other with maiden taking wine with a cherub. A mid 19th century gold diamond memorial ring, the oval-shape blue panel with rose-cut diamond foliate overlay, to the scrolling foliate engraved surround, sides and half-band. Weight 3.8gms. 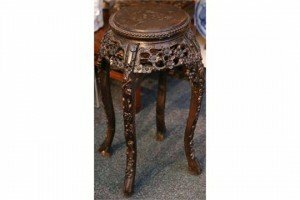 A Chinese rosewood pot stand, with pierced and carved apron, raised on a carved cabriole legs. 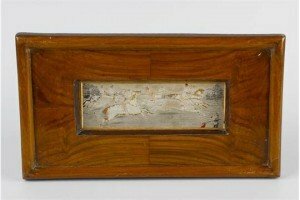 A framed silk work picture of Stevengraph type, depicting a steeplechase with six riders and horses. 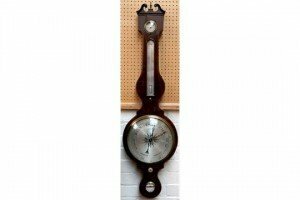 A commercial Road London mahogany wheel barometer, with swan neck pediment above a silver dial and thermometer over the main pressure dial that has spirit level below. 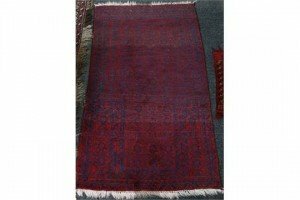 A West Persian rug, decorated with scattered florets, in shades of blue on a cherry ground, enclosed by running and frieze borders. 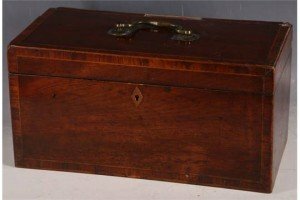 A 19th Century walnut and ebony compendium of games, the hinged rising top and front open to reveal a three-tray compartment of cards, dice cups, etc, a chess set, a draught set, score board. 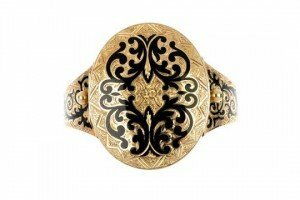 A mid Victorian gold memorial portrait bangle, the scrolling black enamel and floral engraved locket, revealing a hand-tinted photograph of a likeness of Prince Albert, with scrolling hair panel reverse, to the black enamel and scrolling foliate hinged bangle. 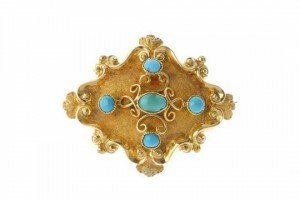 A mid 19th century gold turquoise memorial brooch, the oval turquoise cabochon cross with scroll detail, to the raised scrolling surround. 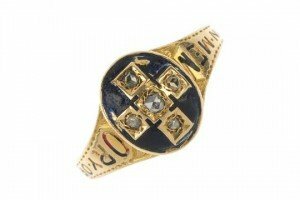 A mid Victorian gold, diamond and enamel memorial ring, oval-shape black enamel panel with old-cut diamond cross, to the ‘In Memory Of’ black enamel shoulders and plain half-band. Estimated total diamond weight 0.10ct. 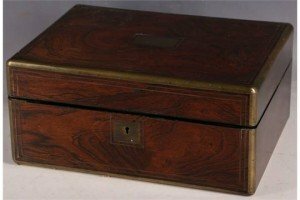 A 19th Century brass bound rosewood box, with rising hinged top opening to reveal jewellery storage and writing items by Hawkes and Wallington. 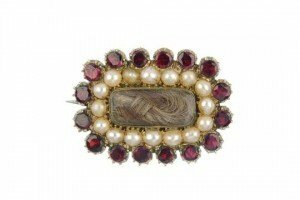 A mid 19th century gold, split pearl and garnet memorial brooch, the central woven hair panel within a split pearl and garnet surround to the engraved reverse. 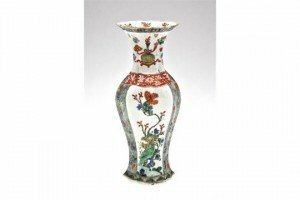 A Chinese Famille vert octagonal section slim vase, with waisted neck having two large panels, one decorated with a bird perched on flowering prunus above rockwork, the other with flowering peony and rockwork, the side panels decorated with butterflies, flowers and foliage, the neck with auspicious objects. 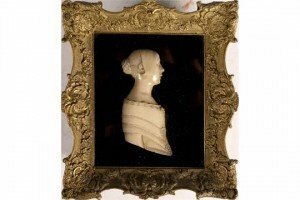 A carved ivorine portrait bust of young Victoria, wearing a lace and flower decorated bodice. 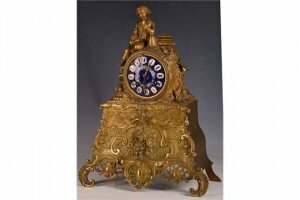 A 19th Century French ormolu clock, with a figure above a polychrome enamelled dial, on elaborate Rococo base. 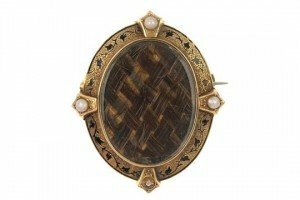 A mid Victorian gold, enamel and split pearl brooch, of oval outline with central woven hair panel to the black enamel leaf surround with split pearl accents and hinged, reverse glass back panel. 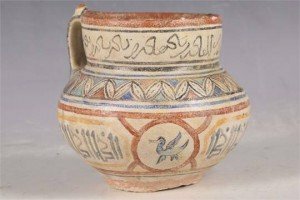 An Iranian single-handled vase, decorated with rings of calligraphic inscriptions and floral designs. 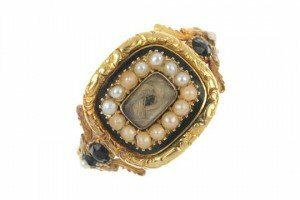 An early 19th century 18ct gold seed pearl and enamel memorial ring, the woven hair panel, within a seed pearl and black enamel border, to the foliate shoulders. 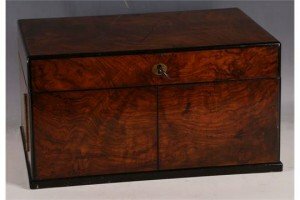 A 19th Century mahogany and crossbanded tea caddy, the hinged lid opening to reveal a blue and white porcelain mixing bowl, flanked by two compartments. 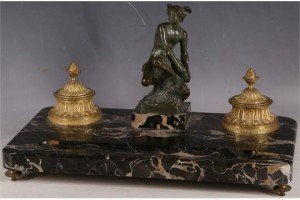 An Edwardian black marble desk standish, surmounted with a verdigris bronze figure of Mercury flanked by inkwells.